The National Socialists began using the term Gau in 1926; at first, it was used to designate supra-regional administrative units of the NSDAP. (The term had been adopted from the gymnastics and sport associations of the 19th century.) After the Nazi takeover in 1933, Gaue eventually also became components of the German state administrative structure and as such replaced federal states. Germany was divided into 42 Gaue, with the NSDAP’s Foreign Organization in Berlin counting as an additional one. Each Gau had a Gau leader [Gauleiter] who was appointed by Hitler himself and who, according to the "Führer principle," was directly responsible to him. Within their individual Gaue, however, Gau leaders had considerable freedom. The Gaue were further divided into districts, groups, cells, and blocks in order to ensure the optimal dissemination of propaganda and the strict control of residents, down to every last detail. This map shows the Gaue and their respective capitals. The areas "annexed" to the Reich after 1938 were declared Reich Gaue and functioned as state administrative districts as well as party Gaue. They were governed by so-called Reich governors [Reichsstatthalter] who doubled as Gau leaders. The map also shows the Reich Gaue established on Austrian (Vienna, Lower Danube, Upper Danube, Styria, Kärnten, Salzburg, and Tirol-Vorarlberg), Czech (Sudetenland) and Polish soil (Danzig-West Prussia, Wartheland) up to 1941. 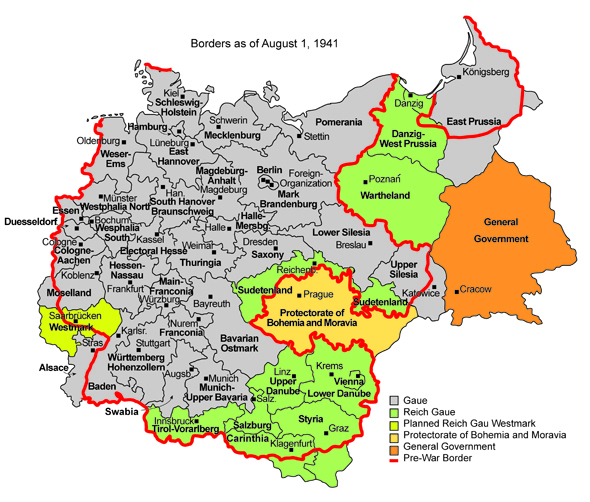 Occupied areas that were not incorporated into the German Reich were designated as follows in Nazi terminology: the General Government (Poland) and the Protectorate of Bohemia and Moravia (Czechoslovakia). © German Historical Institute, Washington, DC, 2008. Cartography by Mapping Solutions, Alaska.